It’s a good bet that President Barack Obama will never use a honey bucket. The five-gallon drums serve as makeshift toilets in large swaths of rural Alaska, where residents empty the waste-filled buckets into nearby sewage lagoons. Obama’s historic visit to the Alaska Arctic on Wednesday will shed a rare spotlight on the plight of Alaska Natives and others who live in more than 200 far-flung Alaskan villages under conditions unimaginable in most of the United States. Obama’s goal on this trip, the first by a sitting president to the Arctic, is to showcase the havoc he says human-influenced climate change is wreaking on Alaska’s delicate landscape: entire rural villages sinking into the ground as permafrost thaws, protective sea ice melts and temperatures climb. Alaska Natives have joined the president in sounding the alarm on climate change. Yet the obstacles they confront daily in rural Alaska extend far deeper, raising questions about whether the federal government has done enough to help some of the country’s most destitute citizens. Even as Obama has sought to improve conditions for Native Americans in recent years, Alaska Natives have received less attention. Outside of Kotzebue, something of a regional hub where Obama will close his three-day tour of Alaska with a speech Wednesday, more than 32 percent of people in the Alaska Arctic lack complete plumbing, according to the U.S. Census Bureau. One in 5 doesn’t have a proper kitchen. This is a life of subsistence hunting for bowhead whales, walruses and seals, a proud tradition of dependence on the land that poses immense logistical challenges. With no roads to their villages, residents are dependent on boats, snowmobiles and bush planes — weather permitting — to ferry them to rare doctor visits or other business. Among Alaska Natives, cancer is the leading killer, with incidence rates about 16 percent higher than for white men and women in the U.S., according to the Centers for Disease Control and Prevention. At the same time, temperatures in the Arctic are rising twice as fast as anywhere else on earth, the National Oceanic and Atmospheric Administration has said, bringing with it profound changes to Alaska’s cherished landscape. Amid dire poverty and few resources, many rural villages have had their foundations literally pulled out from under them as the planet gets warmer. Permafrost, the layer of frozen ice under the surface, is thawing and causing homes, pipes and roads to sink as the soil quickly erodes. Some 100,000 Alaskans live in areas vulnerable to melting permafrost, the Environmental Protection Agency estimates. And in coastal Alaska, sea ice that once offered critical protection is melting, exposing coastlines, causing more extreme ocean storm surges and risking mass emergency evacuations. Pacific walruses, which like to rest on sea ice, have taken to “hauling out” on dry land, producing harrowing images of tens of thousands of walruses piled up on shore, at risk of being trampled. It’s enough that the 400 or so residents of Kivalina, an Arctic town on a skinny barrier island along the Chukchi Sea, have decided they have no choice but to pick up and move. Kivalina and about a dozen other rural villages have voted to relocate to more stable terrain inland despite the hurdles it presents in maintaining their traditions. Hunting marine mammals, for instance, is far tougher when you no longer live along the water, said Robin Bronen, a senior research scientist at the University of Alaska Fairbanks. 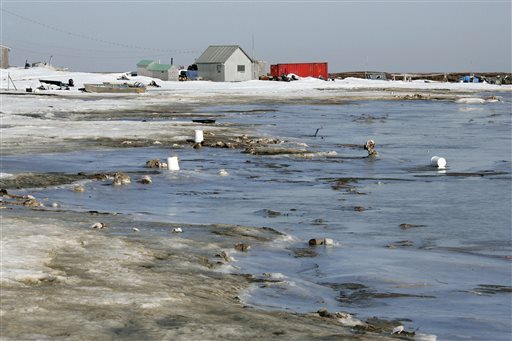 Alaska scholars say the struggles in Kivalina and other rural villages have been compounded by disputes among local, state and federal agencies and a lack of money for large-scale resiliency projects — the relocation of an entire village, for example. One recommendation from an Obama-commissioned task force was for Washington to take the lead in coordinating relocation. But Brian Deese, Obama’s senior adviser, said the administration was looking for ways to be more nimble in helping communities relocate — not to make the decision for them. “It should be easier and more effective for the federal government to come in and support that decision,” Deese said.